G.P. Putnam's Sons, 9780425276747, 544pp. With “an unforgettable cast of characters” (W.E.B. 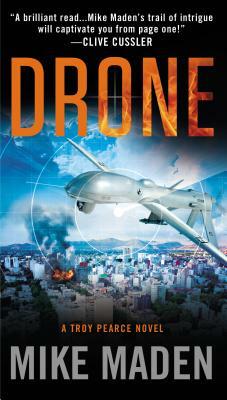 Griffin) and nonstop action, Mike Maden’s Drone kicks off an explosive thriller series exploring the hard realities of drone warfare. Troy Pearce is the CEO of Pearce Systems, a private security firm specializing in drone technologies. A former CIA SOG operative, Pearce used his intelligence and combat skills to hunt down America’s enemies—until he opted out, having seen too many friends sacrificed for political expediency. Now Pearce and his team choose which battles they will take on. Pearce is done with the United States government for good, until a pair of drug cartel hit men assault a group of American students on American soil. New U.S. president Margaret Myers secretly authorizes Pearce Systems to locate and destroy the killers wherever they are. Now Pearce and his team are in a showdown with the hidden powers behind the El Paso attack—unleashing a host of unexpected repercussions.